WHITE Pepper Chef Academy and Cookery School at Lytchett Matravers, which was founded less than 10 years ago, has won the 2018 Food and Travel Magazine award for UK Cookery School of the Year. 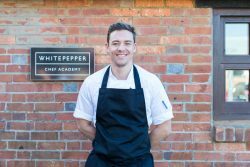 Launched by chef Luke Stuart in 2010, White Pepper specialises in professional chef training underpinned by internationally recognised industry qualifications. The school also runs award-winning recreational cookery courses for amateurs at every level of proficiency. Luke says: “White Pepper has gone from strength to strength since its launch in 2010, thanks to the burgeoning hunger for good food, culinary skills and people’s enthusiasm to support small and authentic local business. We’re genuinely committed to inspiring individuals who want to cook better. Posted in News Feed on 4 October, 2018 .